Why aren’t your job candidates getting back to you? In all likelihood, it’s because your proven methods of communication aren’t working as well as they used to. This is a big problem for two reasons. First, when communication is off, candidates start feeling alienated from the hiring process and become disinterested in your company. Second, if your talent acquisition team is frustrated by the lack of tools to do their jobs effectively, they may start to seek out their own methods – outside of a controlled, compliant workflow. Today, too much of the average recruiter’s time is spent on repetitive, mundane administrative tasks. And to attract job seekers, who are increasingly more informed and demanding consumers, employers place a lot of pressure on their recruiting teams to not only fill positions with qualified people, but to take on a variety of new roles, as well. Strategic recruiters have to be salespeople, marketers, legal compliance experts and organizational planners – and still get it all done as quickly as possible, often with a limited budget. Are Your Recruiters Already Using Text Messaging? There’s a strong chance that members of your talent acquisition team are already experimenting with text recruiting from their personal phones to correspond with candidates more conveniently. But it’s important to realize that in addition to sharing the recruiter’s personal contact information, there’s significant risk imposed when hiring data of this nature isn’t securely maintained or analyzed. If employers don’t provide recruiters the tools they need to effectively and measurably communicate with candidates, they chance falling behind the times and out of compliance. On the other hand, when Sodexo briefly experimented with texting job candidates, their HR leadership was quick to notice the positive candidate response and the value in building out a formal system. By integrating a text recruiting module into their talent acquisition platform, they could perform administrative tasks like job opening announcements, interview scheduling, and updates on current stages within the hiring process, all without leaving their workflow. As a result, Sodexo reduced the average number of touches needed to schedule phone screens from seven down to four and greatly expedited their hiring process, while still holding personal, one-on-one conversations with qualified candidates. Regarding candidate engagement, text recruiting is hard to beat. According to the mobile recruiting platform, TextRecruit (to be transparent, iCIMS acquired TextRecruit earlier this year), more than 90 percent of people read a text message within the first three minutes of receiving it, and texts have a 99 percent open rate, compared to email’s 7.9 percent. Think about it: If you receive a text and an email at the same time, which are you likely to open first? In terms of response rates, email again falls behind with a roughly two percent unique response rate versus 37 percent for texts; and the average response time for text messages is just 12 minutes. The fact that automated emails can easily get flagged as spam or junk is certainly a contributing factor here, too. This is not to say that email is no longer a useful tool for talent acquisition. Rather, this is an opportunity to educate recruiting teams on emerging forms of communication and to help implement new messaging tools more efficiently and compliantly. By applying the proven principles of email recruiting to a texting program, you can ensure that candidate data rights are protected in the same, strategic manner. The simplest premise behind text recruiting is to reach candidates how they want to be reached. According to a study by mobile engagement firm OpenMarket, 75 percent of millennials would prefer text over a phone call if given the choice, citing texts as more convenient and less disruptive. As this generation continues to saturate the workforce and text messaging becomes the norm in talent acquisition, we’ll see an even wider range of candidate communication methods become available via other messaging apps like Facebook messenger, WhatsApp, and WeChat. Candidates want 24/7 help navigating career sites, to be notified of new openings, and guided toward the right roles for them. But they aren’t always eager to jump into interview mode. 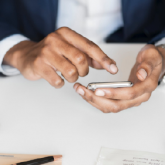 Texting and chatting are less formal than the typical phone screen and don’t put candidates on the spot to provide structured responses right away. This takes the pressure off job seekers who may have time constraints or are still exploring their options. Subsequently, artificial intelligence (AI) and chatbots are being introduced into the hiring process to best serve job seekers who prefer convenient, written communication before speaking directly to a recruiter. With advanced natural language processing, chatbots learn to ask the right questions, provide the right answers, and avoid alienating candidates at any step by responding immediately. Automating repetitive communication tasks with text and chat tools allows recruiters to focus on the high-touch and strategic aspects of talent acquisition, like making the final hiring decision – and drives greater value to the business. Concurrently, job seekers gain a more transparent view into the hiring process, feeling more supported and informed throughout, while avoiding a lot of the stress that typically comes with early recruiter interactions. Don’t let your organization miss out on great hires because the process takes too long or the candidate experience is antiquated. Text recruiting is the new reality, instant messaging will be the norm by tomorrow, and chatbots aren’t far behind – the candidate communication revolution is upon us.